Copyright: © 2018 Guichet J, et al. This is an open-access article distributed under the terms of the Creative Commons Attribution License, which permits unrestricted use, distribution, and reproduction in any medium, provided the original author and source are credited. Bone function requires a good repair system. The quantitative role of each healing component, mainly periosteum and bone marrow/endosteum and of their interactions is not clearly known. To evaluate more precisely the role of periosseous tissues in bone formation, we chose a bone lengthening model in rabbits. Nineteen purebred immature male New Zealand white rabbits were fitted with a femoral lateral external fixator and randomly assigned to 4 intervention groups: 1) Periosteum (PS) and bone marrow (BM) preservation; 2) PS preservation and BM destruction; 3) PS destruction and BM preservation; 4) PS and BM destruction. Animals were killed on day 30 and histology showed different bone regeneration modes. The most frequent ossification in the centre of the distraction gap was enchondral ossification. For bone formed between cortices only group 1 showed a difference (p=0.034). Density of the formed bone at the periosteal site showed a positive effect only with PS preservation, with an interaction of BM and PS. Density of group 4 was different from groups 1 (p=0.028), and 2 (p=0.001). No difference was present between groups at the endosteal sites. PS had a positive effect on the thickness of the formed bone at the periosteal site, with an interaction between PS and BM, but not at the endosteal site. A difference in thickness was noted between group 2 and 4 (p=0.018). Periosteum forms more bone and more likely to spread than bone marrow, but for restoration of the cortical wall, preservation of both shows optimal density results. Bone does not seem to form from surrounding tissues when both periosteum and bone marrow are destroyed. Healing potential is very important to assess in patients with bone fractures or lengthening, as healing problems may lead to complications requiring specific surgeries. Delineating the role and importance of various bone forming tissues and their interactions may allow quantifying the healing response, and thus providing better treatment for patients. Bone regeneration depends from adult mesenchymal stem cells, which can proliferate, form clones in vitro and migrate in various locations . Bone formation can occur by direct, endochondral or chondroid ossification . Stem cells, elaborating these tissues, were shown in the stromal tissue of bone marrow (BM) . Osteochondrogenic properties of periosteum (PS) were demonstrated , and in certain species circulating stem cells were described . In vitro, mesenchymal stem cells obtained from BM can produce myoblasts, chondroblasts, adipocytes, tendon cells, fibroblasts or osteoblasts . Some of the factors or culture conditions able to induce differentiation in one way or another were described [7-13]. Periosteal stem cells can form either bone or cartilage, depending on the culture conditions . In vitro, muscle satellite cells, adipocytes or pericytes can differenciate towards an osteoblast phenotype [15,16]. In vivo, osteoblasts can form from mesenchymal fibroblast-like cells, hypertrophic chondroblasts during enchondral ossification, chondroid cells during chondroid ossification . However, in vivo cellular interactions and local conditions like mechanical stimulations may modify the in vitro bone forming potentials. The aim of this study was to outline the in vivo role of periosseous tissues in supplying bone forming cells during bone regeneration, in rabbits femoral lengthening, known to stimulate bone formation . This experimental, longitudinal study was conducted in the Department of Orthopaedics of the Hospital for Joint Diseases, New York, NY, USA, in accordance with the Institutional Animal Care and Use Committee of Beth Israel Medical Center, NY, USA. Nineteen purebred immature 2.4-3.0 kg New Zealand white rabbits were fitted on one randomly chosen femur with a lateral external fixator. They were randomly assigned to 4 surgical groups: 1) PS and BM preservation (5 animals). The PS was elevated up to its proximal and distal insertions; a corticotomy was performed using a high-speed steel cutter preserving the BM. 2) PS preservation, BM destruction (5 animals). As group 1, but BM was removed and scrapped up to the metaphyseal cancellous bone using a curette. The cavity was filled with radiotransparent polymethylmetacrylate (PMMA). Cooling was provided by irrigation with saline solution at room temperature while the cement hardened. 3) PS destruction, BM preservation (5 animals). The muscle fibers were elevated from the PS, then it was stripped from the bone; corticotomy as Group 1. 4) PS and BM destruction (4 animals): combined Group 2 and 3 procedures. Suture and antibioprophylaxy were performed. Full weightbearing was allowed. Distraction began on day 5 at a rate of 0.25 mm twice a day, and stopped on day 25. Animals were killed on day 30 with pentobarbital and CO2. Femora were harvested with a layer of 0.5 to 1.0 mm of muscle. Specimens were fixed in formalin then radiographs and dual energy X-ray absorptiometry (DXA) were performed. Specimens were dehydrated in methanol for minimum 10 days; fat was removed using toluene 100% for one day. Specimens were then embedded in PMMA. The region of interest was the distraction gap and surrounding areas. Sections were performed using a 0.25 mm thick diamond saw (Buehler-Met, Les Ulis, France). A longitudinal median anterior-posterior section was performed at the distraction gap, including it and the adjacent proximal and distal areas with at least 1.5 cm above and below the gap. A transverse section was performed at the mid-regenerate. Using a microtome Autocutter type E (Reichter-jung, Germany), two 7-μm thick slides were cut at each sectioned surface. Stainings were the Von Kossa technique associated with Giemsa staining. Some Masson’s Trichrome for macrophotography and Silver Methelamine stainings were performed. An optic Polyvar Met microscope (Reichert-Jung, Vienna, Austria) was used, interfaced with a RBG FAC 830I Digital Grundig camera (Germany) to a MacIntosh PowerPC workstation (Cupertino, CA, USA) with an Optilab Pro Version 2.6.1 software (Graftek Imaging, Mystic, CT, USA). Qualitative analysis was performed on transverse and longitudinal sections, while histomorphometry on longitudinal sections. The combined enlargement ratio for measuring densities (DIC, D1 and D2) using optic lenses, camera and computer interfaces was 10. The periosteum and bone marrow thickness were measured with a ruler positioned directly on the slide; displacement of the slide allows a perpendicular measurement on the ruler. Thus far, no enlargement ratio was applied. Reference points for the measurement through the histomorphometric study (Figure 1) were: 1) osteotomy and adjacent zones, 2) lines along inner and outer cortical lines. 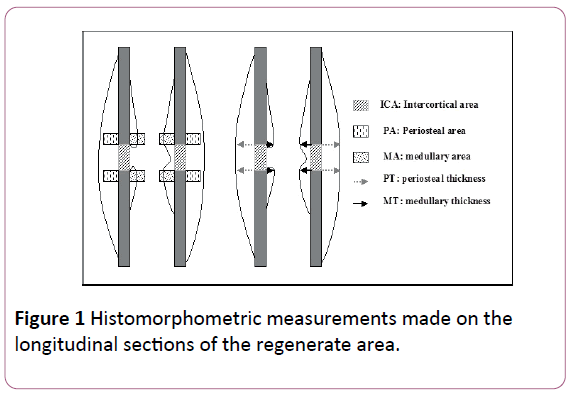 Figure 1: Histomorphometric measurements made on the longitudinal sections of the regenerate area. Several interest areas were measured for density: total intercortical area (DIC) between the proximal and distal cortices; periosteal (D1) and medullary (D2) areas (constant windows with a 10 times magnification). Thickness (in mm) of periosteal and medullary reactions was assessed at the fracture lines. Measured parameters were the relative surface area of bone (in DIC, D1 and D2), of cartilage and of the healing fibrous tissue (in DIC), and the thickness of reaction (in mm) on periosteal (X1) and medullary sides (X2). The anterior and posterior measurements proximally and distally were recorded. Data are given in percent (average of all measurements and standard deviation) for each specimen. The relative surface of bone was the percentage of specific tissue surfaces over total surface of the measured zone: mineralized matrix and osteoid bone for bone, metachromatic matrix for cartilage, and fibrous tissue. The loose connective tissue contained in the bone pores was not counted as fibrous tissue. Statistical tests were performed using BMDP V7.0 program (BMDP Statistical Software Inc., Los Angeles, CA, USA). At the cortical site of the regenerate the effect of PS/BM interaction on bone, cartilage, and fibrous tissue formation was analyzed with a two-way ANOVA, as well as at the periosteal and BM sites the effect of PS/BM interaction on bone formation. The activity of bone formation was separately recorded as the area percent of calcified tissue in the juxta-cortical window and as the reaction thickness (in mm). Differences between groups were analysed with one-way ANOVA. For dependent parameters with significant effect the Kruskal-Wallis test with pair-wise comparisons was performed to determine differences between each group. For the given alpha (e.g., α=0.05) the test power was computed. A statistical power of 0.80 is a minimum to ensure valid results with α=0.05. For the 4 groups, the density of the bone at the cortical area is shown in Table 1, the density and thickness at the periosteal and bone marrow areas are shown in Table 2. Table 1: Tissue density (in %) between cortices at the distraction gap in the four surgical groups Average (AVG), standard deviation (SD). Table 2: Periosteal and endosteal bone formation. Tissue density (in %) and Thickness (mm) in the four surgical groups Average (AVG), Standard Deviation (SD). The effect of periosteum and Bone marrow at the 3 sites (periosteal, intercortical and endosteal sites), is shown using the Brown-Forsythe test (Table 3) and effect of groups is shown using the Kruskal Wallis test (Table 4). Individual results are shown in Table 5. Table 3: Brown-Forsythe test for PS and BM effects on cortical, chondroid and fibrous tissues formation at the distraction gap and their interaction on bone density and thickness at the periosteal and endosteal areas. Statistical significance: + p value (P). Table 4: Kruskal-Wallis Test for effect of groups (Separate Variances) for: 1) Bone, cartilage and fibrous tissue formation in the intercortical areas, 2) Bone density at the periosteal and endosteal sites, 3) Bone thickness at the periosteal and endosteal sites. Table 5: Full results of rabbits from Group 1 G1) to 4 (G4) with bone density and thickness, on the periosteal side (P) and on the bone marrow sides (BM) with averages (AVG) and standard deviations (SD). Group 1: Macroscopically the periosteal bone formation was far less than in group 2, with no fibrous or cartilage differences respect to group 2. The medullary canal was invaded by bone formation; some flow of trabecular bone was spreading along the cortices (Figure 2). Figure 2: Histological examination (group 1) shows periosteal reaction with bone formation in the medullary canal around the BM. Group 2: A large ossification zone around the bone was noted with hypertrophy of bone tissue from periosteal origin, sometimes spread into the muscle. New bone formation was seen between the two bone fragments and in the BM (Figure 3). Resorption process was observed on both sides of the cortical wall. Figure 3: Histological examination (group 2) showing strong PS bone formation without BM formation. Note the periosteal reaction invading the BM space between the two bone fragments. Group 3: The periosteal bone formation was almost invisible, but never absent. Macroscopically, it was present particularly at the distraction gap. As in group 1 the medullar canal was not filled by bone formation, but some flow of trabecular bone was spreading along the cortices, around the BM (Figure 4). Figure 4: Histological examination (group 3) showing, similarly to group 1, no clear invasion of medullar canal by bone, with only some flow of trabecular bone spreading along the cortices, around the BM itself. Note on the right side some scared bone formation not related to periosteal layer around the bone. Group 4: The distraction gap was filled with a neither dense fibrous tissue without ossification nor cartilage tissue. Some lining of periosteal bone formation was seen at the extremities of the periosteal insertions of bone, spreading toward the distraction gap, not joining it (Figure 5). A resorption line was observed at the inner cortex of two specimens. 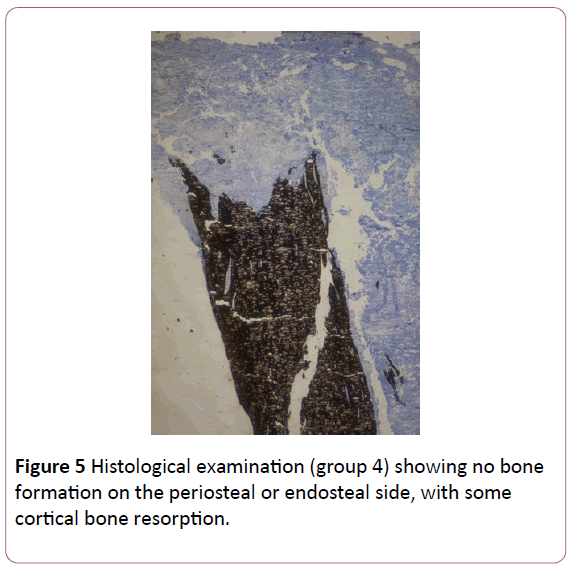 Figure 5: Histological examination (group 4) showing no bone formation on the periosteal or endosteal side, with some cortical bone resorption. In groups 1, 2 and 3 histomorphometric results differed, but similarities of bone formation were observed. First, in every group the diaphyseal bone tissue was remodelled and resorption cavities were visible (Figure 2) closely and far from the distraction gap. The diaphyseal bone was distinguishable from the new bone formed. Trabeculae with variable lengths and connections formed the periosteal regenerate. In group 2, full fusion was observed with filling of the ‘medullary space’ with new bone, indicating migration of bone forming cells. Density of periosteal regenerate in group 1 and 3 was lower than that in the distraction gap. Pores were filled with a loose stromal tissue strongly vascularized, containing few fibroblasts and either none or few BM cells. In groups 1 and 3, periosteal tissue was lined with a thin cortex. Around the periosteal bone PS had always the same pattern: an outer layer of long cells parallel to the bone surface separated by collagen fibers, and an inner layer of polygonal cells superposed in few layers, the superficial one in contact with a thin layer of osteoid tissue at the surface of the trabeculae. Different stages of regenerate bone formation were individualized. Few flows of bone formation, separated by a dense fibrous tissue progressing along the main axis of the bone, were seen. On transverse sections progression was evidenced with spongious bone islands. Ossification progressed centrifugally from these islands; on their outer parts all bone formation types were observed. On longitudinal sections some direct ossification centres were found, surrounded by fibrous tissue either in the gap or PS. It suggests that either some direct ossification centre may appear in the fibrous tissue, or the forming bone flow direction may be not strictly longitudinal. Zones of chondroid ossification were disseminated in the trabecular areas. Chondroid cells were not hypertrophic, did not evolve toward apoptosis, but toward an osteoblastic phenotype. On transverse sections, they were more likely located at the periphery of ossification centers. The most frequent ossification pattern in the growth zone on longitudinal sections located in the center of the distraction gap was enchondral. A regular mineralization of the cartilaginous matrix around hypertrophic chondrocytes was seen, with regular round cavities. The cells were arranged in longitudinal columns. Two kinds of ossifying cartilages were evidenced: one arranged in columns as a growth plate (Figure 1) from stem to hypertrophic cells, another not organized in column, with a not delimitated differentiation zone. Only hypertrophic cells were at the ossification front, and non-hypertrophic cells far from it. Both were at the ossifying front in BM or PS preserved groups. Cartilage progenitor cells seemed to be localized in the fibrous tissue surrounding and separating the ossification centres. A cartilaginous matrix was found in all three groups in different areas: medullary, distraction and periosteal areas. When bone healing was not sufficient to bridge the distraction gap, a cartilaginous tissue interfaced with fibrous tissue was often present. Qualitatively, it was impossible to find differences between bone formation types among groups (Table 4). Most tissue found in regenerated bone was cancellous bone and stromal tissue. Fibrous tissue and cartilage were very scant. No cartilage or ossifying tissue were in the defect zone when both PS and BM were destroyed, suggesting that stem cells for those tissues are only in BM and PS. Bone formed between cortices at the distraction gap: Results of the various groups are shown in Table 1 (intercortical area) and Table 2 (periosteal and endosteal areas with density and bone thickness). Preservation of both PS and BM had a positive effect on bone formation; however, no interaction was observed (Table 3). When the groups were compared for tissue formation (bone, cartilage, fibrous tissue), a positive effect for bone and fibrous tissue was noted. For bone formation, only group 1 was statistically different (p=0.034). For fibrous tissue, group 4 differed from the other three groups (p<0.001). Periosteal and endosteal bone formation: density and thickness: Measurements of the thickness of the periosteal and endosteal bone formation are shown in Table 2. Effects of PS and BM/endosteal bone formation on bone density and thickness of the windows located at the periosteal and endosteal sites are shown in Table 2. When density is compared using the Kruskal-Wallis test with separate variances at the periosteal windows, a difference is noted between groups 1 and 4 (p=0.028) and 2 and 4 (p=0.001); no difference is present at the endosteal sites. A PS positive action was observed at the periosteal site on bone thickness. No effect of endosteum was noted at that site, but an interaction exists. At the endosteal site only endosteum had a positive effect on bone thickness, without interactions. When the thickness is compared using the Kruskal-Wallis test at the periosteal windows (Table 4), a difference is noted between groups 2 and 4 (p=0.018), but not between 1, 2, and 3. At the endosteal site no difference is seen between groups. The multiple regression analysis showed various results for the effect of the periosteum and bone marrow on the bone density and thickness. Density of bone formation at the distraction site: Results are not significant and no equation could be inferred. For bones to achieve a dynamic mechanical support for the body, an efficient repair system is needed in case of injury. This healing system repairs the structure of the bone and restores its mechanical characteristics and function, i.e., “osteostasis.” The repair system has several protagonists, the bone forming stem cells, mainly the periosteum and the bone marrow, helped by other components like including bone morphogenetic protein, growth factors, and hormones (Riley et al. 1996, Schumacher et al. 1996, Urist 1990). In our study we could delineate some quantitative effects using different experimental in vivo conditions, using the lengthening model where the distraction gap is well individualized. We did not use decalcified bone as the decalcifying procedure impairs information about bone structure and formation. Our histomorphometry study comforts the previous DEXA study and shows some interesting features of bone healing in vivo: a) both BM and PS can form bone tissue, confirming literature [17,18]; b) no other tissues can develop osteogenic stem cells; c) during healing, there is no difference in bone formation between BM and PS activities; d) bone quantity formed during healing is greater with PS than with BM; e) it seems to be exchange of undefined information between PS and BM. Migration of periosteal cells occurs, in contrast to migration of BM/endosteal cells. Three types of bone were evidenced in the distraction zone or in the callus around it. Yasui already reported that three modes of ossification were visible during distraction osteogenesis in rats . They showed enchondral formation in the early stage followed by a predominant direct bone formation. We could not evidence the same phenomenon. Coexistence of different modes of bone formation at the same section level, visible on transverse sections, does not favour this hypothesis. Considering ossification pattern, there are two perpendicular directions for bone growth, longitudinal and transverse. The longitudinal growth is often provided by a growth zone, while the transverse by direct or chondroid ossification. The growth zone was not a specific feature of the healing BM/endosteum, as it was also observed with isolated preservation of PS. The histological aspect of bone healing with BM or PS preservation was not different. Both enchondral formations, direct and chondroid, were visible. This suggests that the precursor cells supplied by BM and PS are identical and submitted to similar events and factors, possibly cytokines and growth factors. Interestingly, bone quantity formed at the same time by BM or PS is different. PS produces more bone, suggesting that it can provide more progenitors. Statistical analysis reveals an interaction for bone formation between PS and BM independently from histomorphometric parameters and by-pass effect (selective suppression of BM or PS). It means that PS or BM preservation has an effect on bone formation by the other structure, possibly through a biochemical link. Hematopoietic cells and their paracrine factors may participate in the interaction; hematopoietic and stromal cells are potential stem cells for bone formation, and have contact interactions . PS consists of heterogeneous cell populations with various commitments to osteoblast differentiation. Degree of commitment seems to be most in the cells attaching to the bone surface and lowest from the osteoblastic layer . In certain conditions cultured periosteal cells show a chondrogenic potential . These findings comfort the clinical logics in fractures or lengthening. The periosteum forms bone around it and cells can migrate (even in the bone cavity) to fill out the space created by the elevated periosteum. Large level arms of newly bone formed (wide callus) allow a better stabilization of the bone. On the other way around the bone marrow forms bone more likely around the preserved bone marrow in continuity when a strict corticotomy is produced. The interesting finding, both on the DEXA and the histomorphometry study is that there are interactions between the PS and the BM, of unknown origins, but seems biochemical rather than strictly. Transverse sections show that a transition can exists between connective tissue, cartilage or chondroid tissue and bone, with a metachromatic gradient of the extracellular matrix, suggesting that different cell lines can originate from the same stem cells, as showed in rats, with a longitudinal columnar cells arrangement . Comparing chondrogenic and osteogenic potential of rabbit PS and BM of jaw and long bone, Park noted the higher expansion ability and osteogenic potential of PS . Other Authors demonstrated that under specific conditions both parental and single cell derived clonal cell populations from PS differentiated to chondrocyte, osteoblast, adipocyte and skeletal myocyte lineages in vitro and in vivo . Colnot showed that in mice bone repairing cells are mostly recruited locally. He also demonstrated differences between PS and BM/endosteum influence on cell fate within these tissues. When PS is placed in its original environment or in that of BM, cells derived from PS can produce osteoblasts or chondrocytes; BM did not originate chondrocytes [18,22]. Within the time of our study, when PS and BM were destroyed, no bone formed, indicating that, in vivo, fibroblasts, muscle cells or pericytes were unable to provide osteoprogenitors. Only mesenchymal stem cells from PS or BM could differentiate into osteogenic cells. Presence of different ossification modes in the same regenerate section shows that the pathways from stem cells to osteoblasts are multiple. Nakahara  described functional stages of cell differentiation leading to osteoblasts. A pathway could be observed between the chondroblast/chondroid lineage and osteoblast lineage in regenerative bone during limb lengthening . Chondroid tissue was thoroughly described by Lengelé [24,25]. It seems to be an intermediary tissue between cartilage and bone, showing a different ossification pattern from calcified cartilage or intramembranous bone. Collagen around the chondroid cells is particular: they are embedded in small islets of type II cartilage dispersed within a type I collagen matrix, and can differentiate into osteoblasts, if surrounded by mineralized matrix [24,25]. Enchondral ossification can vary: the differentiating chondrocytes can be organized in columns or without columnar organisation, indicating that distraction can induce a plate-like growth at least during distraction. So, either the stem cells are able to differentiate in growth plate chondrocytes, or the growth plate can be mechanically induced, or both. The growth cartilage without columnar organisation suggests that columns are not necessary for bone growth or enlargement when the mechanical strain is not significant. Our study indicates that BM and PS may have a more complex role than generally expected, being able to interact with different capacities. PS can form great quantities of bone, even in unstable mechanical conditions. BM seems not to be able to act in unstable conditions, due to several reasons: 1) it forms little bone quantity; 2) it cannot migrate and ensure longitudinal mechanical stability of long bones; 3) there is no bone formation in conditions of large motion. Our experimental model suffers from some bias. The scant number of animals is due to the fact that the Ethical Committee did not allow the suppression of more animals when statistical significance was reached; but as differences within groups are smaller than between groups, few subjects are sufficient. Another bias was that BM was destroyed by its removal and setting PMMA into BM cavity. However, this turned out to be an advantage: BM was fully destroyed and could not reform, sterilizing endosteum, which osteogenic activity is impossible to individualize from that of BM. A criticism may be that the exothermic reaction of PMMA may alter the surrounding tissues. However, this was negligible, for the low quantity of PMMA used and the careful cooling during the setting. In fact, no necrosis signs were visible in areas in contact with PMMA, and the periosteum produced a large quantity of new bone. The multiple regression analysis shows the strong effect of the periosteum and the little effect of the bone marrow on the periosteal site, while the periosteum seems to have an effect similar or a bit inferior to the bone marrow at the endosteal site. ‘Osteostasis’ of the bone is insured by mainly the periosteum (which can spread its cells and forms far more bone than the bone marrow/endosteum) and the bone marrow/endosteum. Each component has an effect on the other one, but preservation of both is essential and secures a bone denser at the intercortical area to restore the bone continuity. Interaction mechanisms between the periosteum and the bone marrow/ endosteum are not known, probably biochemical, and we can better foresee the complexity of the bone stem cells system. The muscle and other surrounding soft tissues do not seem to form bone in vivo conditions of our study. This in vivo study is consistent with the results of previous in vitro studies, which showed that both PS and BM can provide stem cells able to regenerate bone tissue. However, it shows that, in vivo, only a limited part of osteogenic differentiation modes from pericytes, adipocytes or myoblasts observed in vitro is found. Jones E, Yang X (2011) Mesenchymal stem cells and bone regeneration: current status. Injury 42: 562-568. Knight MN, Hankenson KD (2013) Mesenchymal Stem Cells in Bone Regeneration. Adv wound care2: 306-316. Ferretti C, Mattioli-Belmonte M (2014) Periosteum derived stem cells for regenerative medicine proposals: Boosting current knowledge. World J Stem Cells 6: 266-277. Evans SF, Chang H, Knothe Tate ML (2013) Elucidating multiscale periosteal mechanobiology: a key to unlocking the smart properties and regenerative capacity of the periosteum? Tissue Eng Part B Rev 19: 147-159. Massberg S, Schaerli P, Knezevic-Maramica I, Köllnberger M, Tubo N, et al. (2007) Immunosurveillance by hematopoietic progenitor cells trafficking through blood, lymph, and peripheral tissues. Cell 131: 994-1008. Bianco P, Riminucci M, Gronthos S, Robey PG (2001) Bone marrow stromal stem cells: nature, biology, and potential applications. Stem Cells 19: 180-192. Koshihara Y, Kawamura M (1989) Prostaglandin D2 stimulates calcification of human osteoblastic cells. Biochem Biophys Res Commun 159: 1206-1212. Fromigué O, Marie PJ, Lomri A (1997) Differential effects of transforming growth factor beta2, dexamethasone and 1,25-dihydroxyvitamin D on human bone marrow stromal cells. Cytokine 9: 613-623. Holbein O, Neidlinger-Wilke C, Suger G, Kinzl L, Claes L (1995) Ilizarov callus distraction produces systemic bone cell mitogens. J Orthop Res 13: 629-638. Martin I, Padera RF, Vunjak-Novakovic G, Freed LE (1998) In vitro differentiation of chick embryo bone marrow stromal cells into cartilaginous and bone-like tissues. J Orthop Res 16: 181-189. Gurlek A, Kumar R (2001) Regulation of osteoblast growth by interactions between transforming growth factor-beta and 1alpha,25-dihydroxyvitamin D3. Crit Rev Eukaryot Gene Expr 11: 299-317. Jørgensen NR, Henriksen Z, Sørensen OH, Civitelli R (2004) Dexamethasone, BMP-2, and 1,25-dihydroxyvitamin D enhance a more differentiated osteoblast phenotype: validation of an in vitro model for human bone marrow-derived primary osteoblasts. Steroids 69: 219-226. Langenbach F, Handschel J (2013) Effects of dexamethasone, ascorbic acid and β-glycerophosphate on the osteogenic differentiation of stem cells in vitro. Stem Cell Res Ther 4: 117. Bari C De, Dell’Accio F, Vanlauwe J, Eyckmans J, Khan IM, et al. (2006) Mesenchymal multipotency of adult human periosteal cells demonstrated by single-cell lineage analysis. Arthritis Rheum 54: 1209-1221. Doherty MJ, Ashton BA, Walsh S, Beresford JN, Grant ME, et al. (1998). Vascular pericytes express osteogenic potential in vitro and in vivo. J Bone Miner Res 13: 828-838. Gimble JM, Robinson CE, Wu X, Kelly KA (1996) The function of adipocytes in the bone marrow stroma: an update. Bone 19: 421-428. Colnot C (2009) Skeletal cell fate decisions within periosteum and bone marrow during bone regeneration. J Bone Miner Res 24: 274-282. Yasui N, Sato M, Ochi T, Kimura T, Kawahata H, et al. (1997) Three modes of ossification during distraction osteogenesis in the rat. J Bone Joint Surg Br 79: 824-830. O’Driscoll SW, Fitzsimmons JS (2001) The role of periosteum in cartilage repair. Clin Orthop Relat Res (391 Suppl): S190-207. Park J, Bae S, Lee P, Lee W, Park Y, et al. (2012) Comparison of Stem Cells Derived from Periosteum and Bone Marrow of Jaw Bone and Long Bone in Rabbit Models. Tissue Eng Regen Med 9: 224-230. Nakahara H, Goldberg VM, Caplan AI (1991) Culture-expanded human periosteal-derived cells exhibit osteochondral potential in vivo. J Orthop Res 9: 465-476. Lengelé B, Schowing J, Dhem A (1996) Chondroid tissue in the early facial morphogenesis of the chick embryo. Anat Embryol (Berl) 193: 505-513. Lengelé B, Schowing J, Dhem A (1996) Embryonic origin and fate of chondroid tissue and secondary cartilages in the avian skull. Anat Rec 246: 377-393. Sarmiento A, Latta LL (1995) Functional Fracture Bracing. Berlin Heidelberg New York: Springer-Verla. MavÃÂiÃÂ B, AntoliÃÂ V (2012) Optimal mechanical environment of the healing bone fracture/osteotomy. Int Orthop 36: 689-695.